Frank Byrnes of Oranmore has announced details of the upcoming ‘Never Give Up’ challenge he has set himself to raise funds for local community organisation Oranmore Maree Coastal Search Unit. 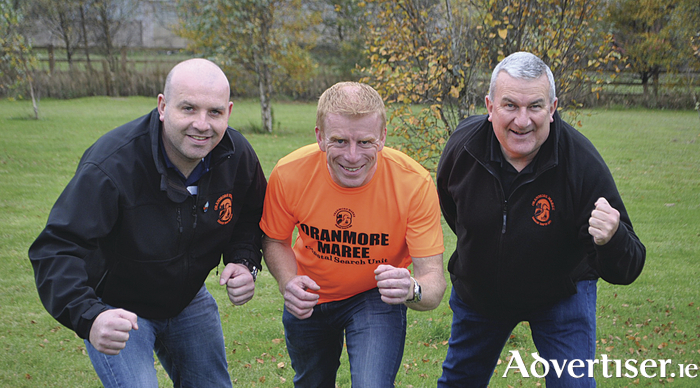 Over a five-week period beginning this Sunday October 30, Frank will take part in three separate running events in an attempt to highlight awareness and to raise funds for the Oranmore Maree Coastal Search Unit. The first event is this weekend’s Dublin City Marathon (26 miles ) on Sunday 30th of October, two weeks later he will put his body under pressure to complete two marathons back to back (52 miles ) on Saturday 3rd and Sunday 4th November at the Belleek Trail Marathon in Ballina, Co. Mayo and on Saturday 3rd December he will undertake the Wicklow Way 50-mile Ultramarathon To sponsor or donate to the ‘Never Give Up’ fund please go to www.ifundraise.ie/omcsu All donations large or small are welcome. Oranmore Maree Coastal Search Unit where Frank is also a volunteer, was set up by local people who were involved in searches for casualties during the last year or more. The vision of these volunteers is that Oranmore Maree Coastal Search Unit would help coordinate future searches and in doing so, provide a caring, pastoral, professional and safe approach in collaboration with members of An Garda Síochána, Civil Defence and Galway Lifeboat who have all welcomed this initiative and have committed to supporting its establishment and development in every way. Sadly, some searches go on for up to five or six weeks and this takes its toll on the family and friends of the missing person. Pastoral and psychological support is necessary for family and friends during this difficult time.